Plot: Between Shades of Gray tells the story of a fictional character’s experiences during Stalin’s little-acknowledged attempt to “cleanse” the Baltic region of anti-Soviet populations he considered undesirable. The book opens on a night in 1941 when fifteen-year-old Lina, her mother, and her younger brother are forced from their home by armed Soviet soldiers and deported. Lina’s gentle, thoughtful father is considered by the Soviets to be a dangerous intellectual, and his family is guilty by association. Lina eventually learns that her father was separately arrested earlier that day and has been sent to a prison camp. Meanwhile, she is loaded into a filthy, crowded train car with her mother and brother and sent to Siberia, where they are forced to fight for their lives in a work camp. The family and other deportees endure starvation, illness, freezing temperatures, cruel guards, and backbreaking labor. Lina struggles to remain hopeful in the face of the very harshest adversity, buoyed by her mother’s incredible love and strength. Adult Content: None, though the book relates a vicious period in history and violence is described in the book (not gratuitously). It should be noted that the themes in this book are very stark and some young readers may find them excessively troubling. Our Take: This book is incredibly harrowing. Although most sixth graders should be able to read the sentences without difficulty, wrapping their heads around the content may not come as easily. We recommend that parents and teachers hand this book only to students who demonstrate a good measure of emotional maturity. Author Sepetys is the child of a Lithuanian refugee, and her burning need to communicate to the world what her father’s motherland endured during the Russian invasion is almost tangible throughout the book. Sepetys did a great deal of research before writing Between Shades of Gray, much of which involved interviewing survivors about their experiences. She shares information about her process and experiences in the back of the book, which makes for a fascinating endnote. Few adults know much about this particularly bleak facet of World War II, which is startling when one considers the scope of Stalin’s destruction; it is estimated that more than six million people were affected by these forced migrations from the Baltics and that over a million people died as a result. 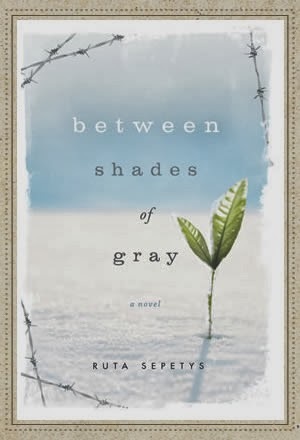 Between Shades of Gray will teach readers about this dark chapter of history, and about the indomitable nature of the human spirit and the power of love.